With the summer season in full swing so are Hawaiian Parties. This is certainly reflective of the amount of Hawaiian Party Products that we are sending out at the moment. Whether you are having a small Barbeque or get-together at home or a big Summer Party a Hawaiian Theme adds lots of fun and helps to get the party underway. Hawaiian Party Supplies are vibrant, traditional and cool. We have a huge range of fantastic Hawaiian Items which all make an impression and add to the mood of the event. All Hawaiian Parties start with Hawaiian Leis, they are easy to wear and perfect to either send out with an invitation for your guests to wear at your party, to hand out as guests arrive or to wear yourself when going to a party. Choose from Rainbow Flowers, Neon or Single Colours and add Floral Wristbands and Headband to complete the look. Hawaiian Skirts are a classic Hawaiian look and we have a great selection including a Multi-Coloured Hula Skirt, a Hula with Flowers and a Neon Pink with Flowers which look lovely with a pair of Lennon style Glasses. Hawaiian Accessories always go down well and a Beachcomber Hat with Flowers and Luau Beads are effortless. To always make sure you are ready for the next drink a Shot Glass on a Beaded Necklace is the best idea. If you are going to a Hawaiian Themed Party in fancy dress then a Pink Hawaiian Shirt is a must for a characteristic look or alternatively you could go for a Beach Babe Vest, a Plastic Hula Hunk or a Hawaiian Beauty Costume. Hawaiian Inflatables are really enjoyable and add loads of colour, Beach Balls, Inflatable Parrots, a Pink Flamingo and a Palm Tree Cooler are always firm favourites. Hawaiian Decorations really set the scene for an exciting party and we have a great selection which includes a Door Cover, a Hawaiian Sign Cutout, a Jointed Surfboard and a Jointed Hula Girl. 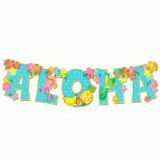 Hawaiian Bunting and Banners are a popular choice to put up to welcome your guests, opt for Hawaiian Aloha Bunting, Aloha Bunting Hawaiian, Luau Pennant Banner Bunting or Palm Tree Garland or have a selection, our range includes many more. Hawaiian Packs are always wanted and our Hawaiian Decoration Pack has all you need. Hawaiian Tableware is essential to complete the theme and as well as Luau Paper Cups Coconut Cups, Cocktail Umbrella Picks and Luau Straws give the summer vibes. With our choice of delivery options including a next day service there is always time to get all of your Hawaiian Novelties. Are you going to or having a Hawaiian Themed Party? We would love to hear from you.